I finished my first run over the weekend. I still don't know what Breaks are. The wiki called them Keeps, or are those also a different thing? I couldn't figure how if the description of the Live or Fes would tell me, or if I just had to get lucky. 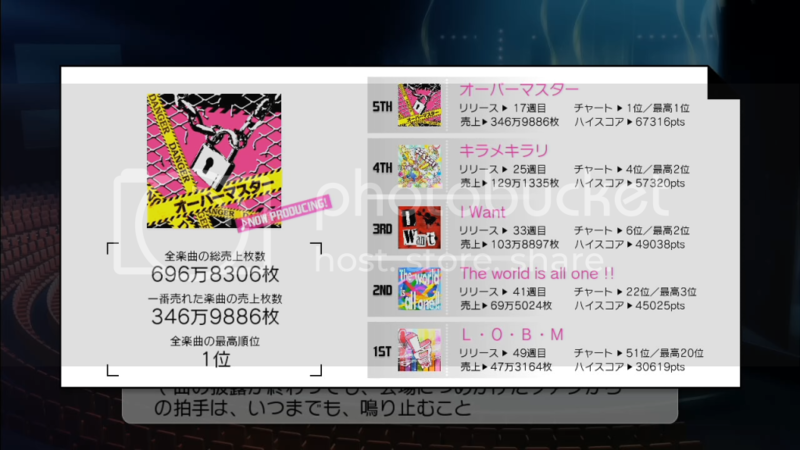 Anyway, I was able to get one song up to 8th place, while others stayed at 50th and 80th almost constantly. It was weird to me. I deliberately failed one of the story events, so I could do Hell Training and earn that PS3 trophy. Otherwise, I never accepted failure and kept doing Retry until I succeeded ... or reloaded the file to choose a different schedule. Fortunately I did not have much trouble passing the required concerts. I got the special amulet from the capital area so I could use it during FIREBALL. My memory appeal was at Level 3. I bought out all of the cheaper (under 20K) accessories from the first store, but I have not visited the second store yet. Second playthrough will be Yayoi, Takane, Mami. Break Status means your currently produced song will sell like it was a new release (Plus it has an icon on Dotop TV). Keeps don't have an icon, and simply repeat last weeks sales. Also, to win the IA award, you need 300k fans and a song in the top 10 on week 55. PS. How do you unlock that amulet? Everywhere I read doesn't quite explain it clearly enough for me. I don't think I had 300k fans. I got 10k fans in three regions to unlock the special festival but could only win two of them. I did get the Top 10 in week 55, so maybe that was it. And I have 2.5 million CD sales according to my results graphic, so maybe that contributed to winning IAGP. The special amulet is obtainable after winning the special festival in the home/capital area. You don't get it for free; it costs 50,000 money. Winning the special festival in the other 5 regions gets you the IA awards, but the fes in the home area gives you the opportunity to buy the amulet. That FES was a huge pain for me. I'm not sure if the opponent's playstyle is always the same for a special FES, but assuming it is, mine charged the burst bar four times to my one. Once I picked up the voltage-boosting reporter and switched an anti-multiplier drain amulet (Niku-Wan) to a voltage-boosting one (Sugamo), I beat it. That's what we have for the IA award for the 360. Maybe they lowered the requirement for Normal Mode like almost everything else. Also, it seems strange that beating the special festival (Xillia, I believe for PS3, Vesperia for 360) unlocks that amulet, it definitely did not when I played the 360 version. It's still the Utahime-Utaouji Festival in the capital region where the Mushaharu amulet comes from. VESPERIA and XILLIA (oh NBGI you) are both in the capital region, though I'm not sure exactly how either are unlocked. Evidently, after looking at the JPwiki, VESPERIA is after reaching Top 10? That sounds like it's correct. XILLIA's only popped up on Hyper for me so far, the week following a release reaching Top 20. 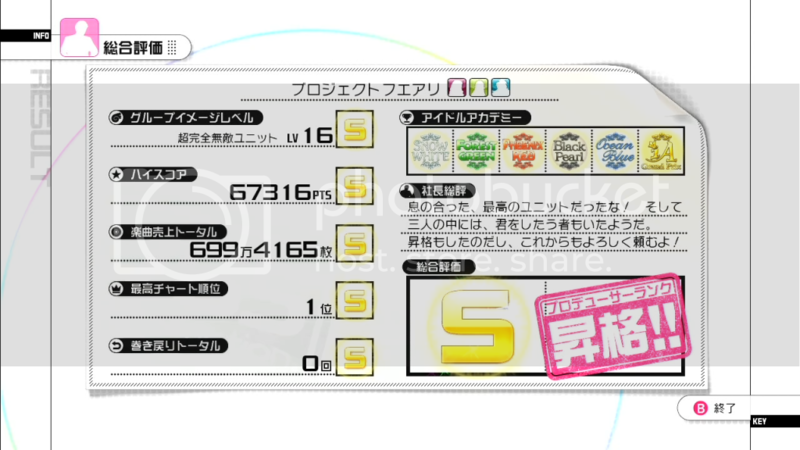 It was a National Audition with 10k fans and 50k money, though I imagine it's near the same difficulty as VESPERIA. Finished Hyper*Voice last night and ran through the RK extra episode with Iori. Just started my 3rd Playthrough. I wanna have Yayoi in my team so I can try to get the Burger Skater and other outfits and stuffs. I'm also gonna try to get atleast 1 award but for ordinary you have to get 100,000 fans in each region except Tokyo. HOW THE **** DO YOU DO THAT?!?!?!?! 4th run finished, first Hyper difficulty attempt. Another Visual/Dance unit, lessons are a bit easier to play on the yet-to-be-replaced-replacement TV. Top 50 by Week 9, Top 20 by Week 17. I was not prepared, as the unit sat at level 12. Everything was a kick in the teeth, so I had to drop just about everything and go for Lessons. Reporters just didn't want to follow, or the unnecessary reporters latched on. Third release went to #7, and I made the mistake of pretty much giving up on supporting releases. Everything topped out at #3, and I was not aware at the time that "S" required a #1 spot. I did manage a Revival in the last few weeks, but couldn't catch up with that #1 spot so late. XILLIA was a let down in comparison to VESPERIA, but it's fine! I wasn't seeking a perfect game since it was the first time into Hyper, yet I'm pleased with it. I had a few weeks to spare, so next run should be a bit easier on scheduling. Everything else scored S, with that sole A rounding out the grade to A. I'll not let up next time! I should add a nano in there... so... nano. I did finally pick up the Hula ALOHA Girl, so only Beyond The Stars left for Extend! BK Maniac is 90% cleared, Lucky Rabbit is 96%! Hibiki next, but that won't start until this weekend. Just beat my first produce! Did terrible as expected..but I got an A for the level of my unit! It was so amazing! And I got the Burger Skater outfit!!! Although now I want to get a PSN card so I can get Jibun Restart! All I want is that song, that's it. 5: The world is all one! It my make or break to plat. So going Vocal main with Hibiki for burst. Producer lvl 8 and 500,000 money in bank so it my now or much later. Finished my third playthrough in Normal Mode with the wonderful Mami as Leader. Songs: Do-Dai, Kosmos Cosmos, Kiramekirari (N.1 in Dotop! ), Relations, Go My Way! This was my best gameplay so far ; I won every awards except the Ocean Blue one (But it's not that bad since I had won it in my second playthrough) and I got "A" in every category. Upgraded to level 4! Yay! Now it's time to try Hyper Mode, with Hibikin as my Leader. I am really anxious! Unit was in extreme exhaustion status when playing the final festival, kicked their butts anyway! Good job! That sounds really intense! Do you have all the achievements yet?